Many religions and cultures have festivals of light. Auckland recently celebrated Diwali, symbolising the triumph of light over darkness; Christmas is just around the corner where trees used to be decorated with candles for Christmas lights. The Jewish festival of lights starting tonight, and lasting “eight crazy nights”, is called Hanukkah (or “Chanukah” or other English spellings for the Hebrew חנוכה). The word means “rededication” and commemorates the Jews’ struggle for religious freedom from the Greek-Syrians more than 2,000 years ago (c160BC). King Antiochus IV Epiphanes had taken over the Second Temple in Jerusalem and ordered an altar to Zeus to be erected. Judaism was prohibited and pigs were ordered to be sacrificed at the altar. The Jews revolted and took back control of Jerusalem. They wanted to light the Menorah, a seven-branch candelabrum, to rededicate the Temple but could find only one-day’s worth of the sacred oil they needed. The oil they found miraculously lasted for eight days – the time needed to prepare a fresh supply of oil. And so we light candles for eight days to commemorate this miracle. The holiday does not commemorate the military victory because Jews do not glorify war. Most festivals are remembered with special food, this is certainly the case for Hanukkah. In this case, the food is usually oily to remember the Temple oil that lasted longer than expected. Traditional food for Hanukkah are donuts (“sufganiyot” in Hebrew) and potato pancakes (“levivot” in Hebrew; “latkas” in Yiddish). In New Zealand, Fish and Chips would be most appropriate also. Hanukkah is also associated with a game that involves a spinning top (“sevivon” in Hebrew; “dreidel” in Yiddish) that has four sides, each with a hebrew letter. In Israel, the letters are different to the ones in New Zealand. That is because the Israeli version has initials for “A Great Miracle Happened Here” while our version is for “A Great Miracle Happened There”. There will be a free public, family event to celebrate Hanukkah in Auckland with candle-lighting, donuts, and spinning tops. 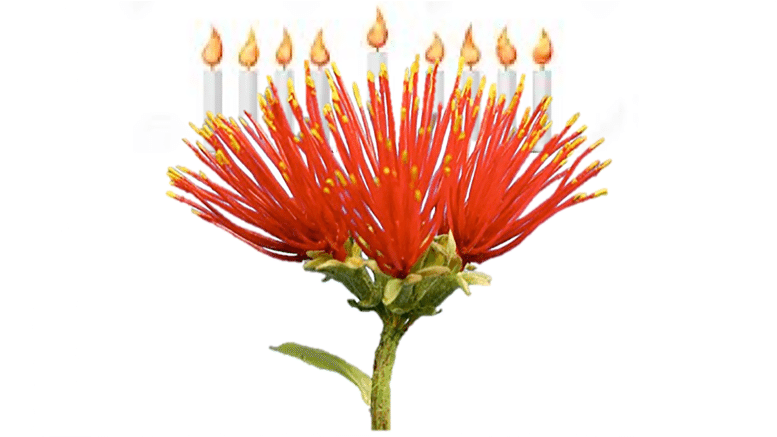 Hanukkah in the Park will be at Albert Park, Auckland, on December 15th (the last night of Hanukkah). Shalom.Kiwi hopes to see you there and wishes you a Happy Hanukkah.